Villa and private pool are as pictured. Breakfast has great Balinese options. The kitchenette also a filtered water system. Since there isn’t a restaurant on the property, I recommend a stop at the supermarket for snacks, fruits, juices etc., for when you feel peckish. Solo woman traveler. Beautiful property, very quiet and private. The breakfast was amazing!!! The staff is so very helpful and friendly. It was perfect for us and our two small children. Staff were so friendly and helpful. Rooms were great, kitchenette was great and the private pool was everything we were hoping. So quiet (except the roosters) with cows, pigs and rice paddies. It actually feels like you’re in Bali. We love the place. And will be back for sure. However, below areas must be met. The secluded aspect is very nice for that intimate time away with your partner, we loved the pool and the spectacular bathroom. It’s a very romantic setting. The swimming pool is big. The room is spacious and clean. The breakfast is good although the choices are limited. The driver was good and the staff were helpful and friendly. Beautiful villa. Felt like you were in your own little paradise. Had roosters, dogs, a cat, loved the seclusion. Daily shuttle service to Ubud. We stayed in town a little later each evening but had the drivers personal cell so he would come pick us up whenever we were ready for a few extra dollars. Awesome driver! Lock in a great price for Bali Taman Ubud – rated 8.3 by recent guests! Bali Taman Ubud This rating is a reflection of how the property compares to the industry standard when it comes to price, facilities and services available. It's based on a self-evaluation by the property. Use this rating to help choose your stay! Offering accommodation with air conditioning, Ubud Bali Park is set in Ubud, 1.7 miles from Ubud Monkey Forest. The accommodation boasts a hot tub. Elephant Cave is 2.3 miles away. Guests can enjoy airport pick up service, free use of 2 bicycles for each room. Ubud Market is 2.4 miles from Ubud Bali Park, while Ubud Palace is 2.4 miles from the property. The nearest airport is Ngurah Rai Airport, 15.5 miles from Ubud Bali Park. When would you like to stay at Bali Taman Ubud? Overlooking the garden, this villa is fitted with air conditioning, a flat-screen TV with satellite channels, a personal safe and mosquito nets. The private bathroom has a bathtub and is stocked with exclusive amenities. This villa has a flat-screen TV, toaster and seating area. 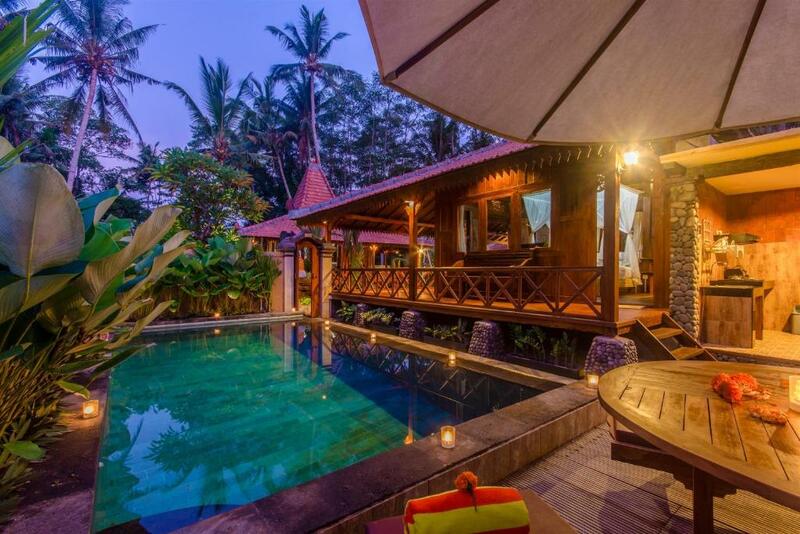 Lestaru Villas is newly built and offer traditional Balinese-style accommodation in Ubud. The Lestaru Villas are a 5-minute drive or half an hour easy walk, from central Ubud and the Monkey Forest. Ngurah Rai International Airport is 1-hour drive from the resort. Sightseeing around Ubud area is one of interesting activities that I like the most. You can see a magnificent rice field, It is perfect for those looking for peace and privacy but also enjoy artistic and spiritual activities in Ubud, the cultural center in Bali. House Rules Bali Taman Ubud takes special requests – add in the next step! One child under 16 years is charged IDR 500000 per night when using existing beds. All children under 2 years are charged IDR 350000 per night in a crib. All children under 16 years are charged IDR 500000 per night for extra beds. Bali Taman Ubud accepts these cards and reserves the right to temporarily hold an amount prior to arrival. Please note that the property offers airport pick up service. Please inform Bali Taman Ubud of your expected arrival time in advance. You can use the Special Requests box when booking, or contact the property directly using the contact details in your confirmation. The breakfast is served in the villa but has almost no variety and it’s small portions. There a lots of bugs but it’s normal cause we’re near a rice field. Sometimes it’s very hard to find people who run the place and they always bring the breakfast late. Very quiet and peaceful. Very beautiful pool and the room is nice (although it would need a little refurbishment). The bed is very comfortable too. There wasn't much forethought in some aspects of the service. i.e. if you take away old cups and glasses, replace them so I can drink some water the next day. On the day we arrived there was no water in the room. Food was often left out for a few hours before someone would come to collect it. I was able to find cheaper deals by simply calling and negotiating a price than was suggested by the hotel reception, so I wouldn't want to book anything through them if it was possible to do it myself, but that is more me being tight with the purse strings, not an issue for those happy to spend an extra 20-30USD per event. The main guy I dealt with was really nice, had great English and really made an effort to make things nice. The place itself was beautiful very nice size room and great with regards to having privacy in the property. They made a great effort to make us comfortable and set the room up in a lovely way every day when we went out. They were helpful in regards to finding a motorbike to travel around. The breakfast could have been better. Overall service could have been better. There was no on-call person after 8 PM when the reception closes. On certain days we arrived in the property after 8 PM, there was no one to assist us with things such as multi-plugs etc. The location and property was great value for money. The villa gave us a good guide and driver - Ketu who was very friendly and accommodative. Very good place. Excellent staff. A little farther from Ubud Center, about 15 minutes or so. We didn’t mind because the Villa was so wonderful but would have been nice to be a bit closer. It is very rustic so expect dust in the wood and very dim lightening but these are minor issues compared to the outside garden and location you get. I found the bed really comfy, the air con was very good!! Good amount of shade and sun spots. The staff were very friendly and helpful. Absolutely beautiful location. Definitely recommend a taxi to get back at night however. We walked once and it was very dark and limited pavements. The jungle is loud at night but its the jungle!! U get used to it after the first night! There wasnt really much that I didnt like about the villa. My only criticism was that the lighting wasnt great, meaning the room could be a bit dark at times. Loved the villa. Really cosy and relaxing. Pool and facilities were excellent. Staff were fantastic and very attentive. Would recommend to anyone. Private room and pool were perfect. Me and my wife can't tolerate with geckos, villa location is inside the the amazing bali farmes so by nature there are a lot of insects and geckos around. At our last day a gecko managed to enter the room and due to villa architecture it's to hard to push it away, it always hides behinde the ceil's wood. This is a something by nature at bali, the staff tried to help a lot even at very late in evening but it was too hard. By the way geckos always in the ceil and the villa has a very strong and clean mosquito net that will protect you from anything. If you can tolerate the geckos then the villa is the greatest private villa you can stay in. Very very privacy, the pool with very large and private. Sun makes it always warm even in evening. Garden and long chairs were very good. The kitchen and the bath were excellent.